Wordfare! Deluxe - Battle w/letters!, Puzzles, Games, Plaques, gifts, and more! Wordfare! Deluxe - Battle w/letters! Wordfare! 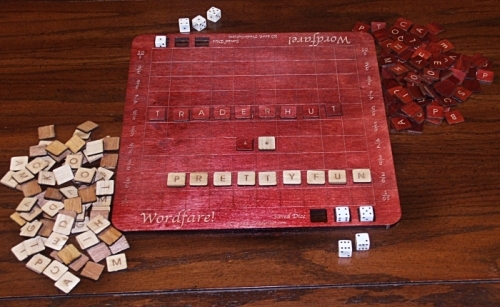 Deluxe is an exciting new game that combines the fun of Scrabble with the strategy of chess! However, unlike chess, you don't need to be a mastermind to be good at it. Wordfare! has been called 'the most innovative word game since Scrabble' and makes an excellent gift for anyone who enjoys words or word games. This is the Deluxe version that includes a marble patterned hardboard box & board. There is a less expensive version here.